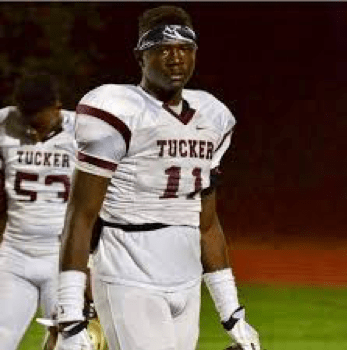 Derrick McClendon anchors the 3rd ranked Tucker Tigers who are on an 8-game winning streak, are undefeated in the region and are 1 win away from the #1 seed going into the playoffs. In region play, the Tigers have given up only 15 points per game. Derrick has been dominant all season as both a defensive lineman and as a tight end on offense. He is praised by his coaches and teammates as a great leader. He is a 4star recruit with offers from all SEC and ACC schools. He is currently committed to Florida State University.